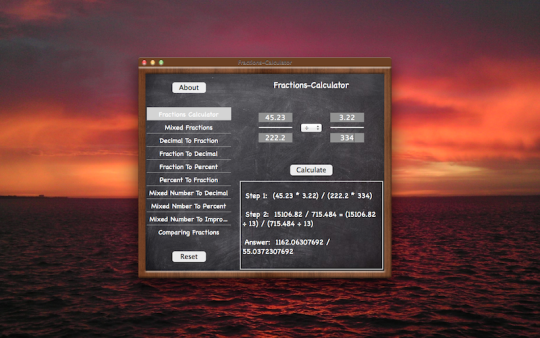 FromiTeamDeveloper:Fractions-Calculator helps you add, subtract, multiply, divide, compare and convert fractions, improper fractions and mixed numbers. The app includes the following fraction problems: Simple Fractions, Mixed Fractions, Decimal to Fractions, Fraction to Decimal, Fraction to Percent, Percent to Fraction, Mixed Number to Decimal, Mixed Number to Percent, Mixed Number to Improper Fractions and Comparing Fractions. Fractions-Calculator it's a great app for anyone who needs to learn these concepts. The calculator will generate a detailed step-by-step explanation for each operation. Record and track all the grades according to your matter/course.